We always knew it, but it’s nice to hear it anyway — Lake Tahoe is above average. This week back-to-back winter storms pushed California’s snowpack to higher than average. What does that mean for us? 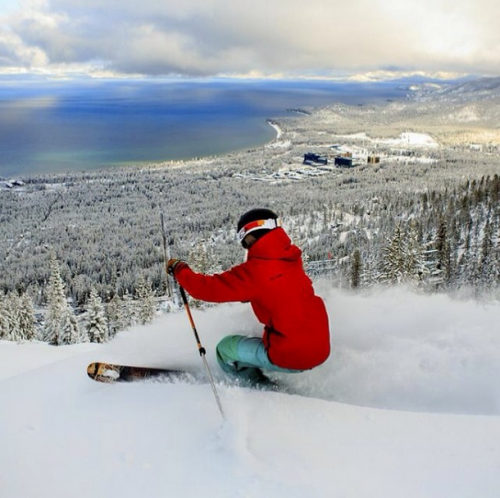 Simply put, it means FUN, with a capital F.
It means more runs on the mountain, more trips down the sledding hill, and more terrain to go out and explore South Tahoe’s recreational activities and attractions. And after a day of winter wonderland, frosty cheeks, and snowball fights, Lake Tahoe Resort Hotel is your home away from home in the mountains complete with a roaring fireplace to warm up after your adventures. Check out our amazing rates for winter stays. Next door to the resort, Heavenly Village is filled with holiday happenings including Heavenly Holidays with Santa’s workshop recreated in a 16-foot snow globe, ice sculpting, and a New Year’s Eve celebration with a free outdoor concert by The LA All Stars, and an East Coast, 9 p.m. gondola ball drop followed by fireworks. We will be ringing in the New Year in the hotel’s main atrium with a midnight balloon drop. Enjoy Christmas or New Year’s Eve dinner at Echo Restaurant. Our award winning Chef Sal has created special menus of fresh farm-to-table items. Due to the holiday, we do require reservations for these dinners; please call soon as seats may fill up! There are still some rooms available for the holiday. Come enjoy the snow. We dressed up just for you. For current snow and weather conditions at Lake Tahoe South Shore resorts go to www.skiheavenly.com; www.kirkwood.com; www.sierraattahoe.com. Or look for yourself on these Tahoe area webcams: Heavenly; Kirkwood; Sierra-at-Tahoe.